Panoramic views from this high rise view home in Irvine! This is your chance to own luxury Irvine condo in one of the premier luxury buildings in the city of Irvine, CA. Highly secure guard gate buildings with 2 car garage parking in building. 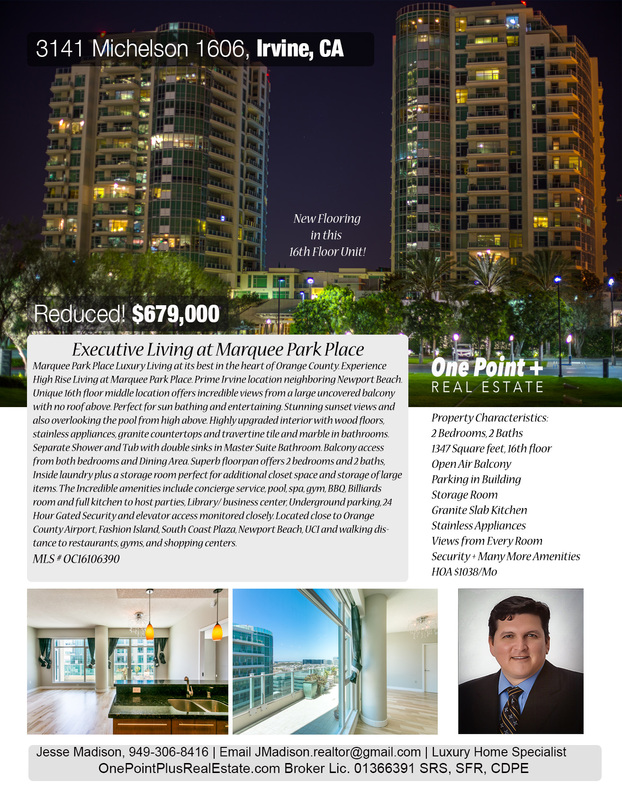 Beautiful 2 Bedroom, 2 Bath home on the 16th floor at Marquee Park Place. Experience the life of luxury in the heart of Orange County. Close to Orange County Airport SNA. Prime Irvine location neighboring Newport Beach. Offers incredible views from a large uncovered balcony with no roof above. Perfect for sun bathing and entertaining. Stunning sunset views and also overlooking the pool from high above. Highly upgraded interior with wood floors, stainless appliances, granite countertops and travertine tile and marble in bathrooms. Separate Shower and Tub with double sinks in Master Suite Bathroom. Balcony access from both bedrooms and Dining Area. Superb floorpan offers 2 bedrooms and 2 baths, Inside laundry plus a storage room perfect for additional closet space and storage of large items. The Incredible amenities include concierge service, pool, spa, gym, BBQ, Billiards room and full kitchen to host parties, Library/ business center, Underground parking, 24 Hour Gated Security and elevator access monitored closely. This luxury Irvine condo is located close to Orange County Airport, Fashion Island, South Coast Plaza, Newport Beach, UCI and walking distance to restaurants, gyms, and shopping centers. Each spacious, luxuriously-appointed residence at the Marquee includes high ceilings, full height windows framing expansive wall-to-wall views, cozy gas fireplaces and spacious entertainment-size balconies and decks. The finest materials and fixtures are featured including quality wood cabinetry of either cherry, walnut or zebrawood with granite countertops; professional quality stainless steel appliances; Kohler fixtures and faucets; rich flooring in hardwood, limestone and marble.